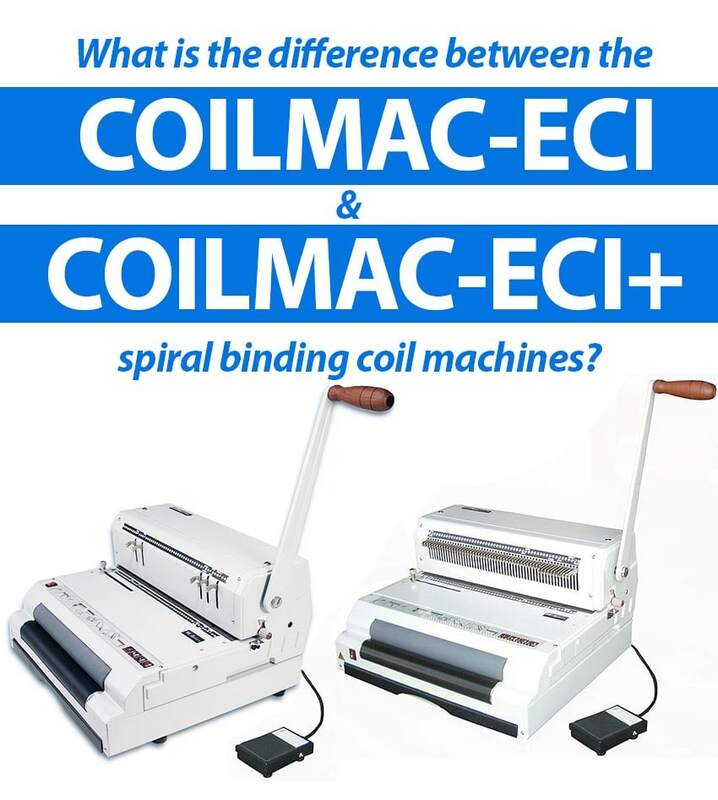 What's the Difference Between the CoilMac-ECI & CoilMac-ECI Plus spiral binding machines? Customers frequently approach us requesting the true differences between the Akiles CoilMac ECI and the Akiles CoilMac ECI Plus; this article will review both binding machine models, their advantages, and their limitations. Both CoilMac machines punch and bind Spiral Binding Plastic Coil, a flexible and durable biding method utilized by a variety of businesses, organizations, schools, restaurants, and homes. 5 Pins can be disengaged. Helps with alignment of most common paper sizes. All 53 pins can be disengaged. Allows you to use a completely custom sheet size, a custom punching pattern, etc. Hole Shape Standard round holes. Premium oval holes. Makes inserting coils easier, especially for thicker books. Hole Spacing (Pitch) Standard 4:1 pitch (4 holes per inch) with 0.250 spacing. Premium 4:1 pitch (4 holes per inch) with 0.248 spacing. Slight difference makes for perfect spacing of 11" binding edges. Allows for easier inserting of coils. In the above photo, we point out the differences and similarities. Differences are listed in orange, and similarities in blue. With the most complete system of functions and a built-in electric coil inserter, the Akiles CoilMac-ECI series is in a class all to itself. The CoilMac-ECI makes spiral binding fast & easy, and that's why we have dubbed it as the ideal partner for mid-volume workloads in office environments. The disengagement punching pins allow for a clean punch with multiple paper sizes - the more pins can be disengaged, the more versatile a binding edge you can work with. 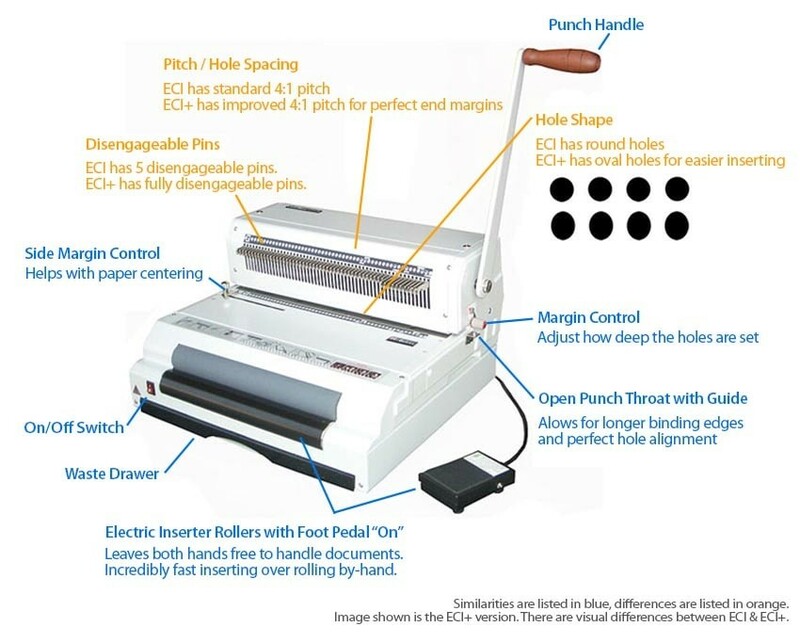 This feature is ideal for those who will be punching any sheet size other than letter, as it allows you to control how many holes you page has, giving you the capability to eliminate half of a hole punch on the end of your sheet. The plus version has fully disengageable punch pins, while the standard model has 5. The hole shape is also different. Most spiral binders will have standard round holes (like the standard model), but the plus features slightly oval holes. This makes is much easier to insert coils, especially when you are working with thick books and large coils. In addition, the standard version has a standard 4:1 pitch (holes per inch) with a 0.250 spacing, while the plus has an improved 4:1 pitch with a slightly different 0.248 hole spacing; this slight difference was created to produce perfect spaced holes for letter size 8.5" x 11" sheets. The punching margin control provides the correct punch-margin-depth for each spiral binding coil size while maximizing the document's tear resistance. The deeper set the holes are, the stronger the bind will be. The open punching throat and continuous punching guide allow for an easy alignment and punching of documents larger that 13". The electric spiral binding coil inserter is foot pedal operated, allowing the free use of both hands and granting the operator complete rotating control of the roller. This drastically reduces time and costs by making the inserting surprisingly fast and easy. The CoilMac ECI series binding machines will punch through up to 20 sheets of 20 lb. paper, and will bind as many as 290 sheets of 20 lb. paper using the 32mm plastic spiral coils.